‘Opening The Gates’ begins well with a hefty, distorted guitar churning out a heavy and slow riff, underscored by almost tribal like drumming. When joined by a second guitar, things become even more intense, despite the drums sounding frighteningly thin. As everything explodes into an even bigger sound, the odd production choice becomes evident, as the riff – by this point gaining an extra layer of distortion and a soaring lead – moves from the expectantly heavy in a death metal stance to being cold and confronting, as if melding the harder edges of industrial sounds with the starkness of Scandinavian black metal. On this instrumental, it kind of works, but moving into the bulk of the material with vocals – as first heard on ‘Destroying The Temples of the Gods’ – it becomes almost too confrontational to take in. The barrage of cold mechanics are enormous, while a more traditional death growl really adds to the ugliness. If you make it past that, obviously, it’s helpful, but Nihilistic Legion – so obviously not doing things by half measures – throw a very harsh drum sound into the bargain. Although not very well produced, the drums have a reasonable amount of clout when it comes to bass pedals, but elsewhere, things are just…misjudged. There’s a hard snare sound that sounds like a rimshot off of a sheet of metal, which when placed above the general cacophonous noise appears piercing, almost distracting… It’s just enough to detract from the better death metal elements: if this were of a purer death persuasion, the obtrusive mix might work, but with the simultaneous presence of an oppressive grindcore slant – although, again, well played – it’s a difficult listen. A very difficult listen. The title track doesn’t even give the listener grace of an intro, preferring instead to crash in with an aggressively pneumatic riff; it’s a riff so full on, there’s almost no human quality. The unrelenting drums sound like the work of triggers, while the previously deeper guitar sounds are replaced with a sheet of metallic noise that makes Soilwork’s ‘Steel Bath Suicide’ sound like Swedish pop. The more traditional death metal vocals are the track’s high point once more – performed with depth, guts and passion – while a lead guitar, rising above the buzzsaw sounds to deliver extreme piercing solos suggests there’s more going on than first appears. The production brings out the louder elements and in doing so makes Nihilistic Legion sound unstoppable, but it’s incredibly unforgiving. This number is of those times when, just maybe, less might’ve been more, so to speak, but there’s little doubt as to whether Nihilistic Legion – whether viewed as a band, or just Tohu – is one hundred percent committed. The final pairing raises the quality level somewhat, with ‘Son of Lies’ being home to a guitar riff that sounds like the works of Golohor remixed by Al Jourgensen, which – naturally – comes with an ear-bleeding ugliness you’ll either love or hate. The drums too, settle somewhere unexpectedly between death metal traditions and extreme industrial loops (a feeling reinforced by the return of that crashing metallic sound). In terms of the frighteningly confrontational sounds Nihilistic Legion favour, this is their most well-rounded affair, even taking into consideration a fairly trad death metal vocal. In some ways, the last track, a cover of Taake’s ‘Fra Vadested Til Vaandesmed’, is the EP’s most appealing. The black metal infused production is more sympathetic to this brutal six and a half minute workout. The spooky, cold, folk metal riff that informs the intro is very distinctive, before the drums rattle with an aggressive edge and the vocals rise to dominance. A slower section melds a classic thrash riff to a guttural growl before teasing with a very melodic riff and is particularly thoughtful. The second half of the track sounds even more savage as the riffs intensify, seemingly thrashing out the same chords over and over until they become an ear-bleeding noise…but listen more carefully, and from deep within, there’s a gentle folk melody piercing through – recalling those opening riffs – reinforcing Scandinavian traditions. Like Nihilistic Legion’s self-penned tracks, this is really difficult listening in places, but unlike so much of the music preceding it, it’s a track made more palatable by a couple of superb riffs. 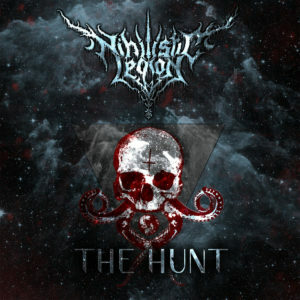 On the basis of this EP, Nihilistic Legion’s work is loaded with speed and power…huge amounts of power. It takes more than those two factors to create a genuinely great extreme metal release, however. That drum sound is likely what you’ll remember most vividly by the end of these five tracks, and not necessarily in a good way. The overall mix is too abrasive to allow for a decent sense of light and shade, which obviously means, at times, it’s very hard to tell whether the arrangements are as good as you’d hope, while the general lack of bottom end on this recording is somewhat of a let down. The cover tune is worth a spin if you like extreme blackened folk-metal, but otherwise, this is hard work. If you want noisy metal for noisy metal’s sake, there’s a good chance you’ll get a quick thrill from ‘The Hunt’, but that’s about it, despite Tohu’s obvious enthusiasm. …And that’s a pity, since he so obviously has bucket-loads of that. This entry was posted in Album & EP Reviews and tagged death metal, free download, grindcore, industrial, israel, nihilistic legion, stream by Real Gone. Bookmark the permalink.